Mishaps in Methodology – Nobody questions the data. Again. AllThingsD has screenshots of a survey conducted by Consumer Intelligence Research Partners (CIRP). Unfortunately AllThingsD fails to link to said survey or inform us about the mothodology of said survey. Something I really really hate. Because I feel that in this day and age, tech reporters happily jump an anything they get handed for free that makes for a nice headline. 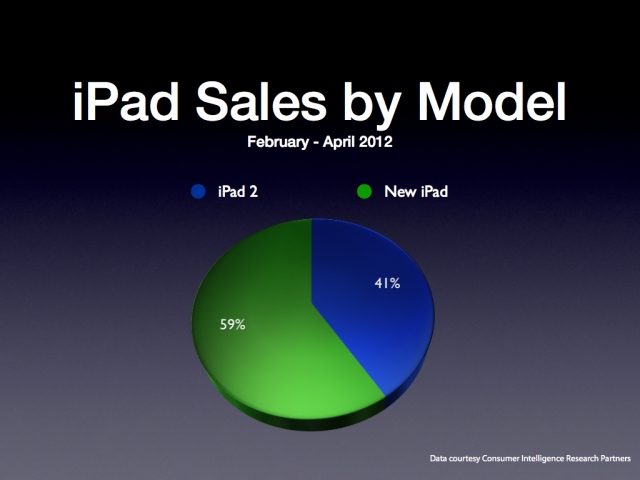 Anyway, John Paczkowski mentions one tidbit about the survey that tells us that 41% of all iPads sold were iPad2s, namely that the survey took place „between February and April of 2012“. Which sounds interesting. Because the new iPad went on sale on the 7th of March, 2012. That’s five weeks into the twelve week timeframe the survey took place. 5 of 12. 5 divided by 12. 0.41. Fourtyone percent. Vorheriger Beitrag Schärfster Konkurrent des neuen iPad ist das alte iPad? Ich zweifle daran.